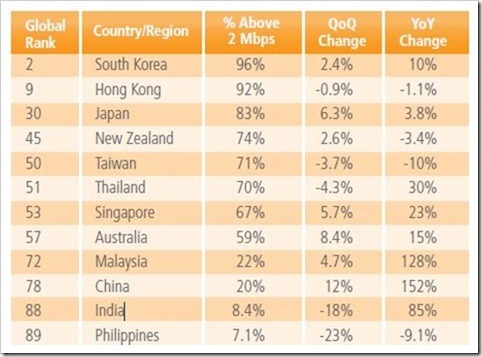 India’s internet plight – Only country in Asia below 1 mbps average Speed! 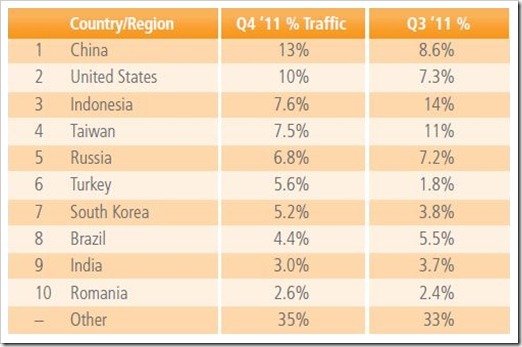 The Akamai State of Internet report for Q4, 2011 is out – and it does not paint a good picture for India. 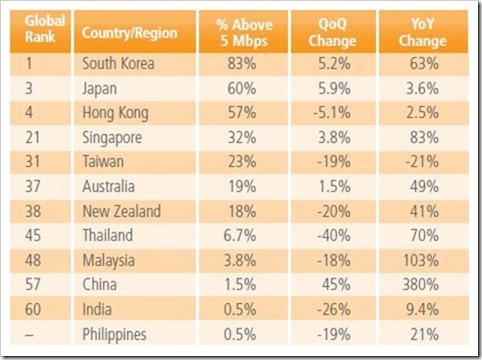 Among all the countries surveyed by Akamai, India is the only country in Asia to have average internet speed of less than 1 mbps and less than 1% broadband adoption rate. While countries like Japan & Hong Kong have average internet speeds of 10 mbps, India (0.9 mbps) has 1/10th their average speeds. I am not even talking about South Korea, who has the fastest average internet speed in the world at 17.5 mbps. India does make in Top 10 of one particular list (which it should not) – India has 9th highest rate of attack traffic in the world and 5th highest in Asia. As far as narrowband connectivity (below 256 kbps) goes, India comes in at 5th in the world. More than quarter of Indian internet users are on less than 256 kbps connectivity, making India one of the countries having slowest internet connectivity. 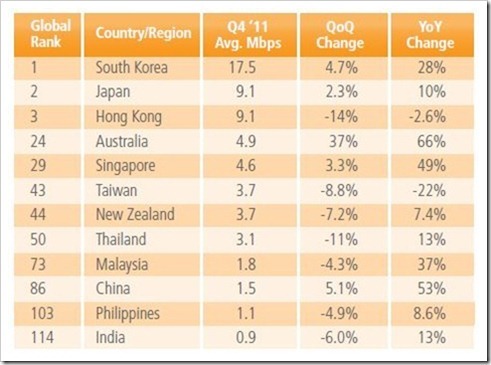 Akamai report states, India was the only country with high broadband (> 5 mbps) adoption rate of below 1%. Given such low penetration, one would think that India would be experiencing tremendous growth, however, that is far from truth. The report states that after strong growth in the third quarter of 2011, it lost whooping 26% in the fourth quarter, ending the year at meagre 0.5% high broadband adoption. Even countries like Thailand (6.7%), Malaysia (3.8%) and China (1.5%) have much higher percentages of high broadband connectivity. There is one silver lining – although speeds above 5 mbps have not grown much, normal broadband connectivity (above 2 mbps) have grown at decent rate of 85% year on year. But again, if you look at QoQ growth, India showed a negative growth of 18%. So we have lesser internet consumers on 2mbps connectivity then what we had in previous quarter. India ranks a very lowly 88th in the world when it comes to rate of broadband adoption. Only 8.4% of Indian internet consumers have over 2mbps internet connections! It is fair to say that India has missed the terrestrial broadband revolution – However, I ‘d expected that these numbers would be much higher due to launch of 3G. Looks like we have a fair way to go before we can call ourselves an IT hub. Would be interesting to know reader’s views on this! Mobile Internet will soon surpass PC internet usage! 20 mbps unlimited internet for Rs.2500 in India – Why only in Hyderabad? Indian Internet speeds go from Bad to Worse! Broadband Subscribers in India – Maharashtra Leads! Not only there is less bandwidth, there is frequent connectivity drop as well. In terms of quality, I believe Indian Internet providers (which are telecom players) use outdated technology and unfriendly equipment. Look at internet wireless data card – Once you put in USB , neighbouring slots are useless. Also a strong monopoly – all devices are from same company. So no option other than changing color and look & feel. Hidden truth – May be this device capability to be checked. BSNL provide value for money – Unlimited is really unlimited but then no guarantee that in critical hours / in between video conference you will be taken off and may takes few minutes to get back. An eye opener for the people enjoying their stay in government service and those who are chosen to govern the country. Thank you for making this available and hope somebody in the ministry take note of it. As an interim state owned Bsnl should double the connection speed and data downloading limit in all its existing plans wherever technical feasibility permits. Lack of flexible schemes can also be one of the reasons. Cost is another factor for majority of the population. Long way to be called an IT hub. Thou cost is factor, But truely speaking it all comes down to the infrastructure. We need to have better IT infrastructure, which will eventually lead to higher speed at lower cost. And government can only help in this by coming up with better scheme for ITES companies.